New Boston Ventures is proposing a modernist development in the South End on the site of the former Holy Trinity German Catholic Church in Boston’s South End. It’s a problem confronting many neighborhoods in the Boston area: what to do with that beautiful but abandoned church that was an anchor of the community for so long. The struggles of the Catholic Church, in particular, have left many residential areas pocked with deconsecrated houses of worship. With open parcels scarce and Boston’s real estate market hotter than ever, these churches are increasingly attractive as condominium developments. But tinkering with the old and the holy, it turns out, comes with a particular set of challenges. For one thing, neighbors are often uneasy at the thought of stuffing condos — often inhabited by wealthy outsiders, no less — into an institution where past generations were married and baptized. 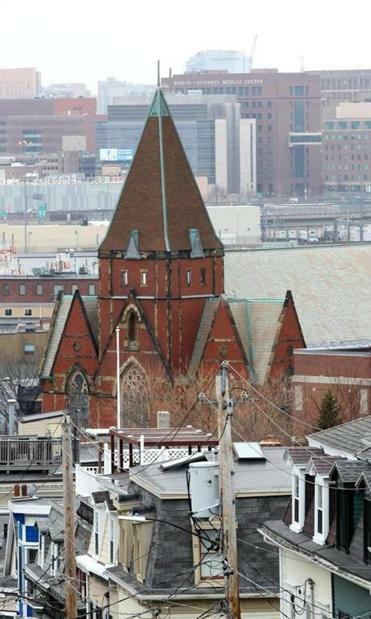 “Anybody who goes into a neighborhood and buys a church, without having some knowledge and sensitivity, they’re asking for trouble,” said Boston developer Bruce Daniel, who spent years fighting South Boston residents on his plan to put condos on the site of the closed St. Augustine’s Church. 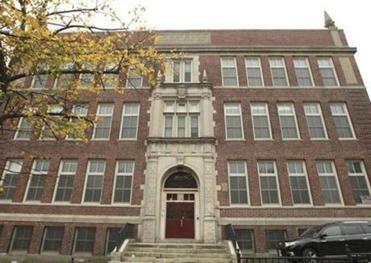 Residents are mounting a late effort to block the conversion of the old Gate of Heaven School into condominiums. Daniel originally proposed demolishing St. Augustine’s and erecting a new building, a plan he now admits was not realistic. St. Augustine in South Boston is being preserved in a condo development. Construction is now underway on a compromise that preserves St. Augustine’s exterior. The neighbors, though, were put in the position of choosing between a demolished St. Augustine’s and a renovated one. Put so starkly, condos were preferable to rubble. 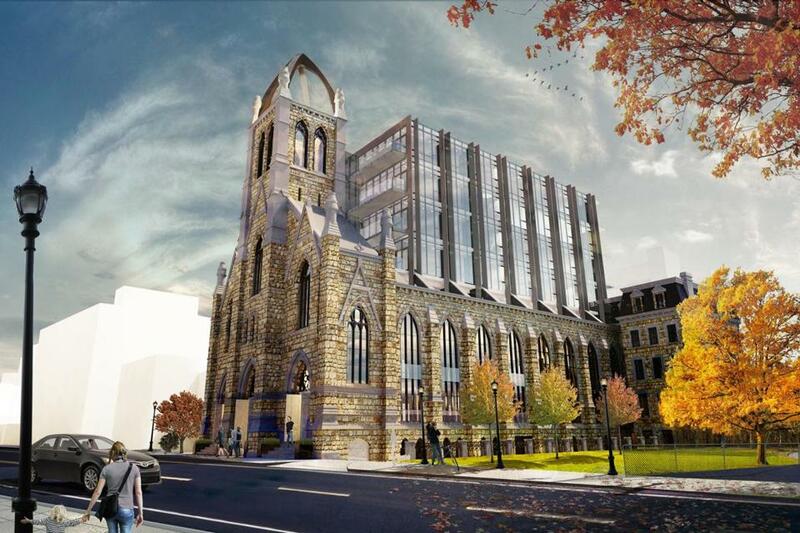 Maybe the boldest reimagining of church architecture is unfolding in the South End, where New Boston Ventures is proposing a modernist condominium building within the former Holy Trinity German Catholic Church and rectory on Shawmut Avenue. The design is a fearless grafting of new onto old, calling for a gleaming, glassy cube to punch through the roof of the stone church, built in 1877. The company says the project’s look and height are appropriate, given the recent construction of big residential projects nearby. Former churches in the suburbs, meanwhile, are more likely to get knocked down than to undergo an expensive renovation. Binette’s firm recently demolished a church it bought in Salem for exactly that reason. But in Brookline, it turned the former St. Aiden Church, where John F. Kennedy was baptized, into the centerpiece of a condo complex — though not before a lawsuit and years of battling neighbors. Some developers try to quell neighborhood opposition by hewing closely to a church’s original design. One such project is the former St. Peter and Paul’s Catholic Church on West Broadway in South Boston, converted to condos in 2003 by James McFarland and architect R. Wendell Phillips. Outside, the only indications of the condos within are the new windows, skylights, and decks set into the sloped roof, plus a small sign on the gate. A visitor walking by would be forgiven if he tried to pop in for Sunday morning services. Inside, however, is a different story. Churches were not meant to be subdivided into residential units; their awkward and cavernous spaces, outmoded structural designs, and features such as four-story-tall windows give architects headaches. In some condos at St. Peter, bedrooms are squeezed up against the arches, and columns spear through living rooms. 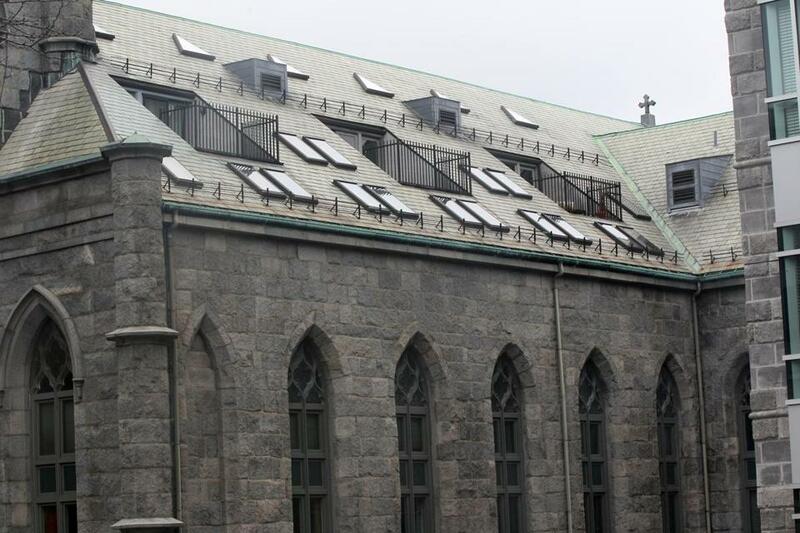 Skylights and balconies were built into Saints Peter and Paul Church in South Boston. Gund’s celebrated 1983 Church Court project in the Back Bay became a model for later church conversions. His design tastefully incorporated the stone ruins of the burned Mount Vernon Church, near Massachusetts Avenue and Beacon Street, into a mostly new condo complex with sweeping views of the Charles River. Saving fire-ruined churches and other aging buildings wasn’t always in vogue. During the post-war “urban renewal” period that lingered into the 1970s, historic buildings and even entire neighborhoods were bulldozed in accordance with grand plans to transform cityscapes. Gund recalled feeling horror as he drove through the wreckage of Boston’s West End as a high school student in the 1960s, when the neighborhood was being torn down to make way for Government Center. Church Court, Gund said, was in some ways a statement against urban renewal’s “sweep-away- the-old” philosophy. Today, many developers share Gund’s view. Despite a handful of successful church conversions completed by nonprofits, such as Blessed Sacrament in Hyde Park, they argue condo conversions are often the best chance to save old churches.